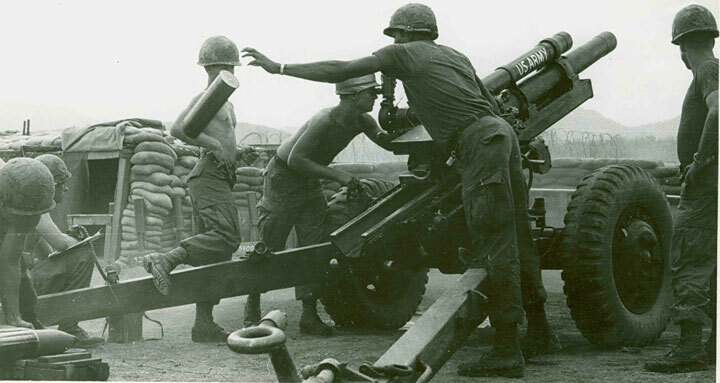 The Vietnam Fire Support Base (FSB) exhibit is one of the prominent features of the Army Heritage Trail. Our collection of 105mm artillery howitzers aim over defensive berms and barbed wire to represent the layout of fire support bases used by American forces during the Vietnam War. 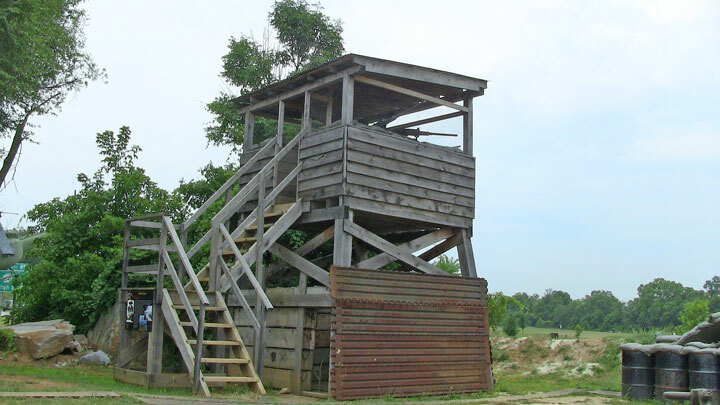 The base also contains sandbagged munitions storage bunkers and a guard tower with a view of the entire trail. 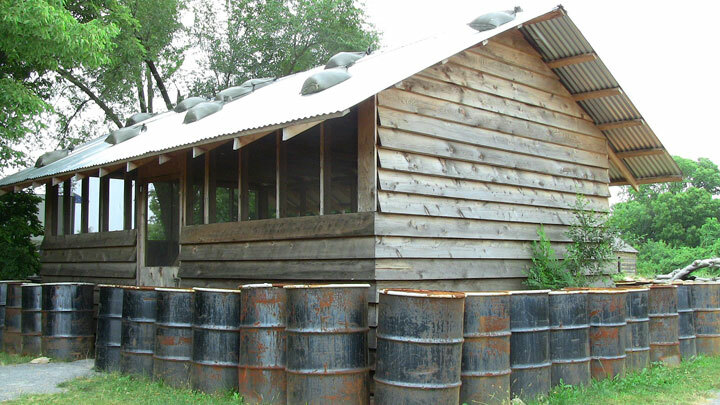 Within the compound, the "Hootch" display gives visitors a feel for how the Soldiers lived when stationed at a FSB. Behind the compound, a Huey Helicopter is approaching the FSB on a resupply mission, flying low over the representative termite hills of the Battle of Ia Drang exhibit. 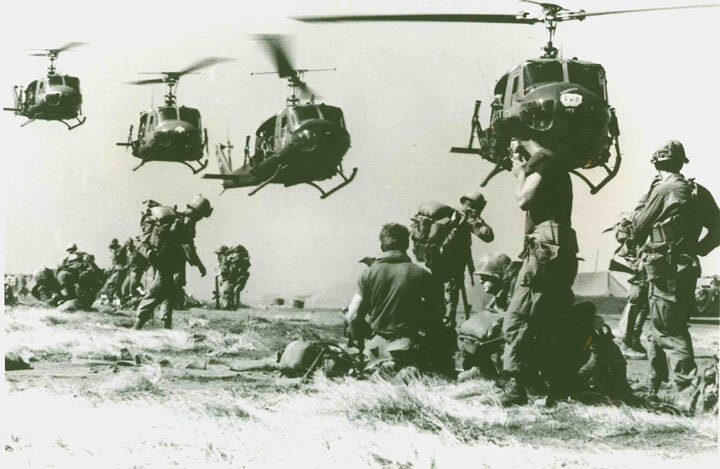 In 1965, the United States began large-scale commitment of troops to ground combat in the expanding conflict in Vietnam. Infantry maneuvers intensified as the Army began to adapt to fast-paced and non-traditional combat. 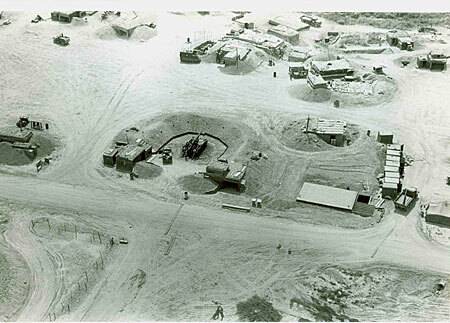 To support the increasing number of Soldiers on patrol, the Army developed permanent and semi-permanent artillery support camps throughout the battle zones. The camps, called Fire Support Bases (FSB), provided a center of defense for the artillerymen and infantry troops operating in the area, protection for command and control personnel, a first-aid medical facility, and a relatively safe place for helicopters to land to resupply the FSB. 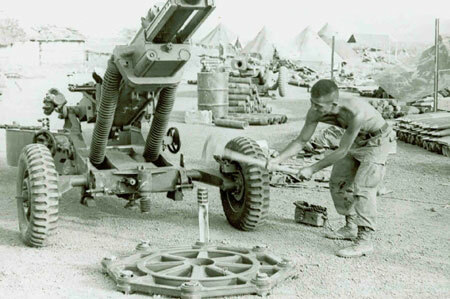 Over time, the FSBs grew to become the central feature in many Soldiers' lives. A FSB was built for one main purpose: to provide a base for field artillery to fire in support of infantry missions. 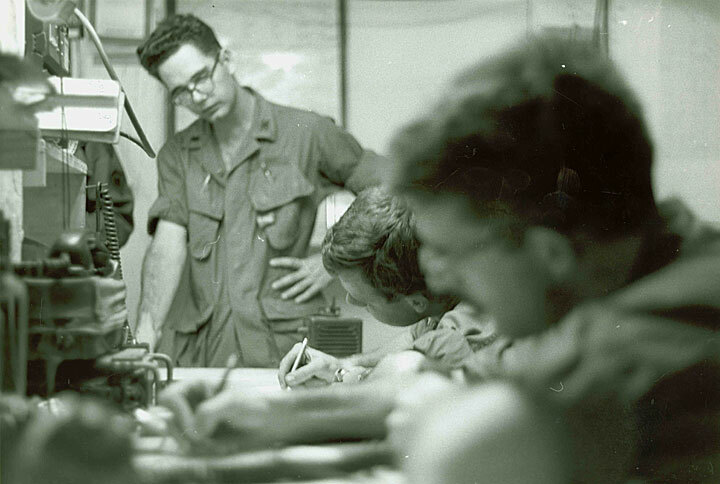 Bases also fired to protect neighboring firebases, convoys traveling through their sector, and sometimes to simply fire "Harassment and Interdiction" missions into the jungle where the the enemy operated. 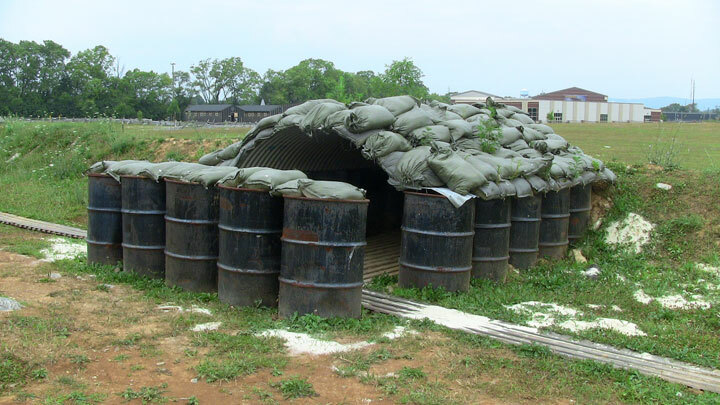 The bases dotted the Vietnamese countryside, located strategically on hilltops and around pre-existing structures or airstrips to give maximum range and 360 degree coverage by the big guns. "FSB Kramer is luxurious in fields of fire and interior space. It is approximately 250 meters in diameter, surrounded by a four foot black earth berm, and one strand of [barbed] wire 20 meters beyond the berm. North of its center is an open field, large enough to accommodate the medivac ships [helicopters]. On the north end is the TOC (Tactical Operations Center), which has its own interior berm about three feet high. South of the center field . . . is the 155mm Howtzer [sic] Battery, formed in a star pattern with the number 6 piece in the center. Across from the howitzers on the west side, are the two eight inch pieces. Tents and trailers grouped in small clusters throughout the base complete the picture." 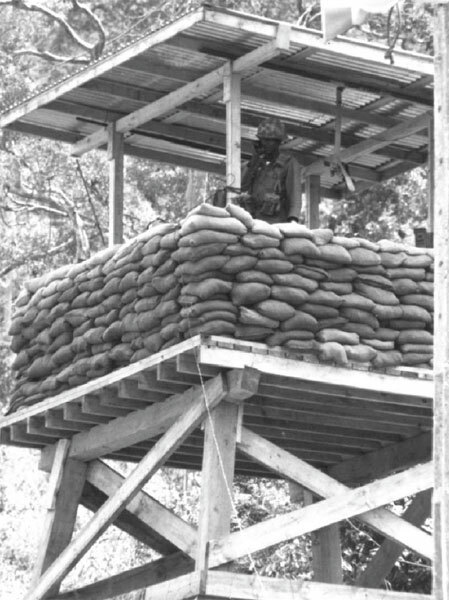 Shanties made of wood and sandbags, called "Hootches," bunkers for the Fire Direction Control (FDC), and guard towers rounded out the set up. "Beyond the berm on the southwest side, the woodline is . . . 75 meters away. Along the rest of the perimeter the distance from the berm to the woods varies from 150 to 200 meters . . . allowing excellent fields of fire to the D Company tanks, Headquarters Troop tracks, and the two II Field Force "dusters" that ring the berm. "The star formation of the 155mm Howitzers gives a better coverage in an impact area. The five guns on the points of the star have a 6400 mil [360 degree] capacity for berm defensive fires. 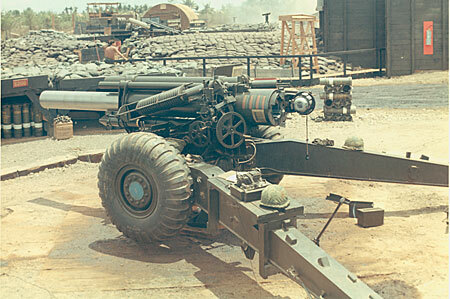 The center gun may fire self-illumination as needed, or can add its fire to the fire missions. For ground probes the battery can fire Killer-Junior capacity, although the minimum safety range is greater than the Howitzers. 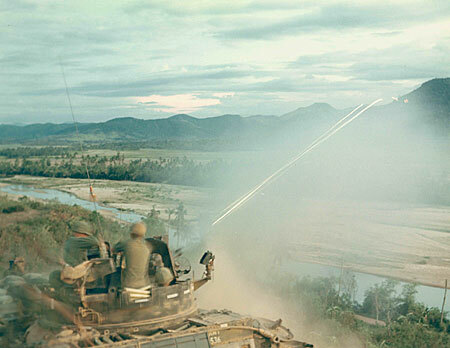 The Killer-Junior fires can be used to block an enemy withdrawal or as direct support." As stated in the After Action Report, the in-depth defenses were indeed formidable. 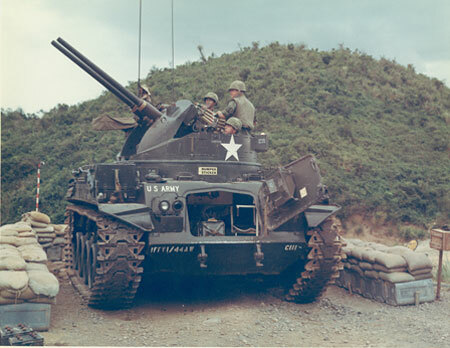 The "dusters" mentioned were M42 tracks with two 40mm fully automatic cannons mounted together to fire in tandem. The amount of ammunition these weapons could shoot at the enemy was staggering. 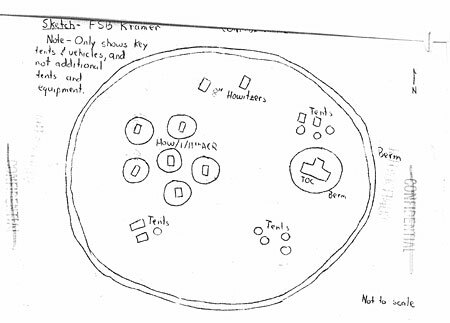 In addition, berms and trenches encircled the big guns, furnishing defensive positions for infantry and off duty artillerymen during an attack. The guns could fire "Killer Junior" missions in support of neighboring fire bases or even, in some cases, in support of themselves. The Killer Junior missions consisted of guns firing high explosive (HE) rounds at a range of two hundred to one thousand meters. The HE burst a few feet off the ground, providing a shield of shrapnel all around the perimeter. In extreme cases, when the wire, berms and outer defenses were breached, the last defense was direct fire from the big guns themselves. Harkening back to the cast-iron cannons of old, the howitzers and other artillery pieces fired the modern version of a canister shot: the beehive flechette round. "Although the canvas tents, with their two foot wall of sandbags, look vulnerable, they are not. Each man dug a shallow trench for his cot, and then had used the extracted dirt to fill sandbags which were then used to build individual walls around each cot. Thus the troopers had protection from mortar blasts and shrapnel. Some crewmen of the tracks [tank crews] on the berm had built bunkers into the earthen wall of the perimeter. To reinforce their construction, the troopers had used ammunition boxes and sand bags. "LTC Reed designed a new type of bunker to protect the 155mm Howitzer ammunition. The design featured a horseshoe shape with complete overhead coverage. A bulldozer pushed up diagonal earth walls to further protect the ammunition. The howitzer covered the fourth open wall. 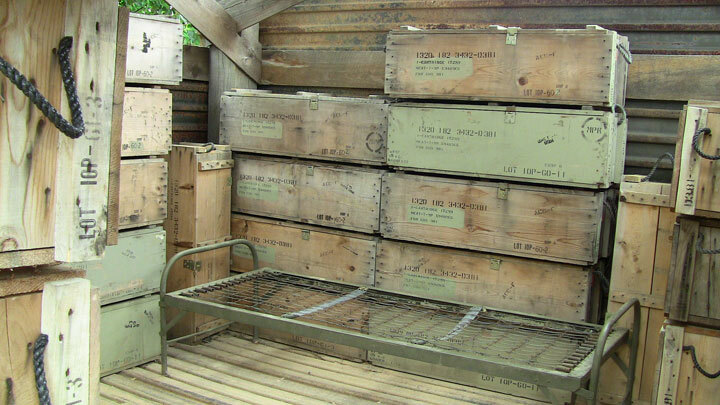 The eight inch ammunition was buried in a deep trench with both ends open and two feet of overhead cover. The Howitzer ammunition was sheltered above ground and not subject to the flooding of monsoon rains." FSBs defended themselves and performed fire support missions only if they could stay supplied. Most firebases were accessible by truck convoys, but the remote FSBs relied on helicopters, both for defensive fire support and resupply. The Bell UH-1 Iroquois, also known as the "Huey," provided both, while the AH-1 Cobra was primarily an attack helicopter. For heavy lifting and transport of supplies and artillery pieces, the FSBs relied on the CH-47 Chinook. 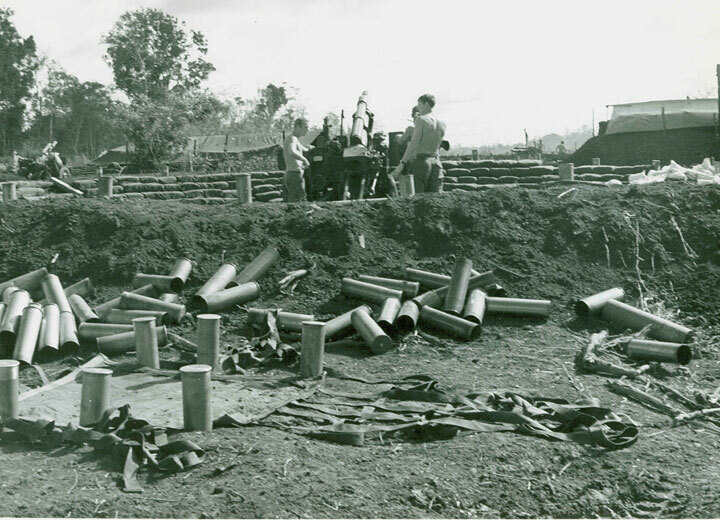 Fire Support Bases were one of the strategic and tactical success of the war in Vietnam. While an FSB was not the most comfortable or safe place for a Soldier, it was an island home in a sea of hostility. 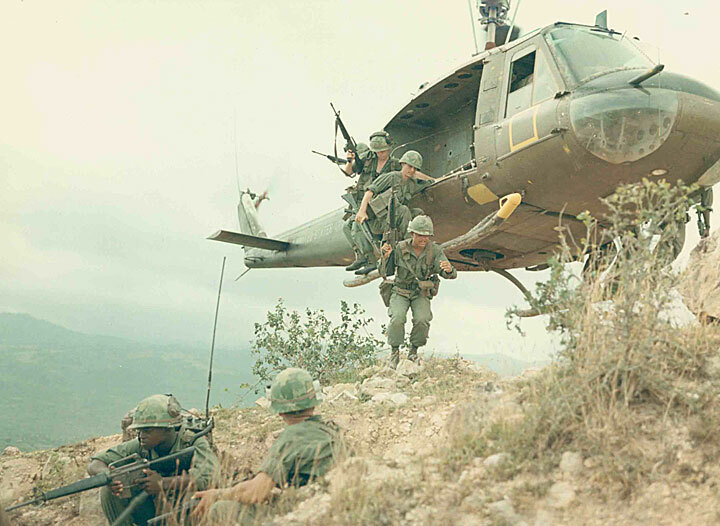 Soldiers of Troop 3, 1st Recon Squadron, 9th Cavalry, 1st Cavalry Division (Airmobile) dispatch from a UH-1D helicopter on a search and destroy mission. A young artillery officer oversees his Fire Direction Control team.